The holidays are a wonderful time. Thanksgiving is a feast shared with family and friends. Christmas is a celebration of life and love – a time to exult in the joy of giving. New Year’s is a time to reflect on the past, plan for the future, and rejoice in the present. Let us cook your Thanksgiving feast. In truth, the holidays can also be a stressful time, especially for folks who enjoy hosting them. 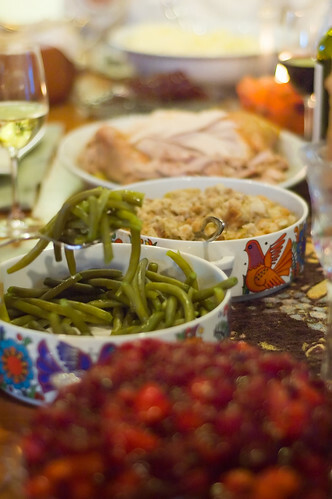 Feasts require days of planning and food preparation. Entertaining requires a clean and tidy home. Gifts must be either purchased or made. By the time Thanksgiving, Christmas, and New Year’s have passed, many people feel the need for a vacation. This year, consider incorporating a vacation into your holiday plans. Break up the monotony of always hosting, or always schlepping from one relative’s house to the next. This year, spend Thanksgiving on beautiful Chincoteague Island, at the Island Manor House, our Chincoteague Bed and Breakfast. Spend your time walking on the sparkling sands of Assateague Island, watching the wild ponies frolic, and witnessing the miraculous migration of beautiful Snow Geese. Go for an invigorating bike ride around the island. Warm yourself by the fire, curled up with a good book and a glass of wine or cup of coffee. Let us do the work for you. We’ll cook, we’ll clean. You’ll relax, eat, drink, and be merry. Read on for details about the Holiday Packages at our Chincoteague Island Bed and Breakfast. Please call 1.800.852.1505 for more information, or visit our reservations page to reserve your blissful Thanksgiving holiday at the Island Manor House.